Images are a very important part of every mobile application. However, handling them from the Android developer’s perspective is not an easy task. They can come from different sources (assets, files, web, …) and they can have different formats (jpg, png, …). No wonder then that most developers are using Glide, Picasso or another 3rd party library in order to simplify decoding and displaying images. The first one allows us to create drawable or bitmap from different sources (file, byte buffer, resource, URI and asset file). The second one extends Drawable.class and is capable of displaying GIF and WEBP animations. Source object can be created from any thread because it only captures values. Also, one source object can be reused for multiple drawable/bitmap decoding processes and it can even be accessed from different threads. 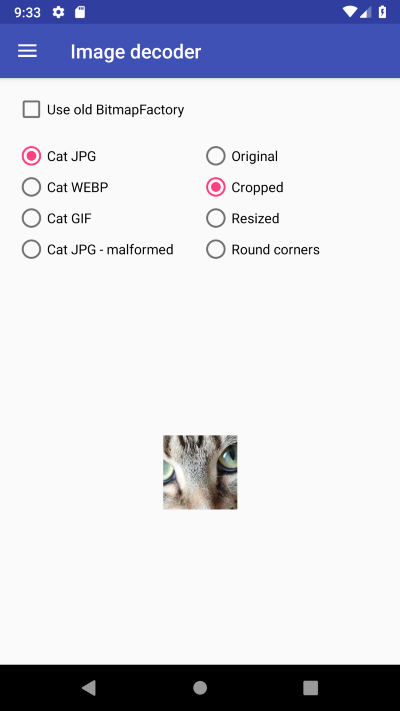 Previously, Android P GIF and WEBP were not directly supported. Using BitmapFactory.decode...() or Drawable.create...() methods, on an animated file, lead only to create static images with the first frame of the animation. Apps were able to display GIFs using Glide library or using Movieclass as described here. ImageDecoder will recognise types of provided source to decode, for static images it will create BitmapDrawable and for animated images — AnimatedImageDrawable. All we need to do more of is to start an animation. We can also decode the source of animated objects into bitmap but then we will receive only the first frame of the animation in the form of a bitmap. 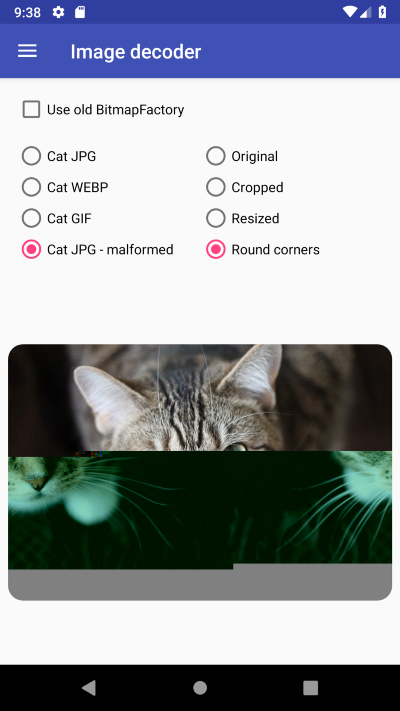 What is really cool about ImageDecoder is the way we can implement image transformations. On decoder object we can also set custom PostProcessor which allow us to get access directly to the Canvas of an image or animation. 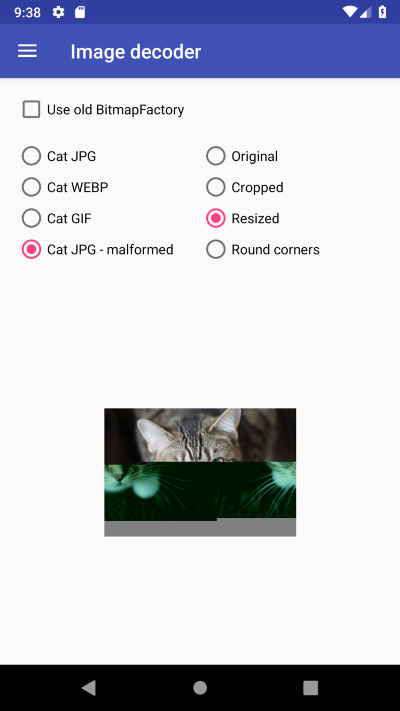 Transformations can be applied both on static image and on animated GIF or WEBP. When custom PostProcessor is used with AnimatedImageDrawable then OnHeaderDecodedListener callback method is invoked only once but the post processor drawing method is applied to every frame of the animation. android.graphics.ImageDecoder$DecodeException: Failed to create image decoder with message 'invalid input'Input contained an error. API unification is always a good thing so introducing those new components is definitely a step in the right direction in order to make the developers work easier. Image transformations can now be implemented more easily than in Glide or Picasso libraries. 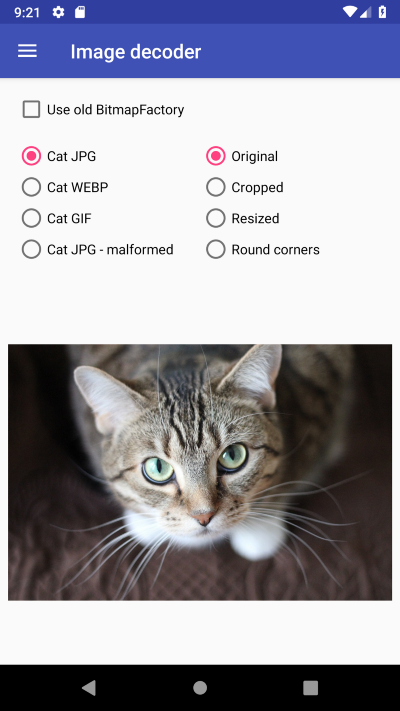 About adding support for GIF and WEBP — well, better late than never. Sadly, both ImageDecoder and AnimatedImageDrawable are only available on Android P and above so in order to use it on older devices we need to wait for the release of a suitable component in the compat library.